You can group projects based on criteria, requirements, clients, users and various other project needs. By grouping projects, you can segregate multiple projects and efficiently manage your project groups. For instance, if you’re working in a company that runs projects across departments like finance, invoices, and accounts. Selecting the projects in a particular category can be daunting, you may go baffled at times. To reduce the cumbersome process, you can groups projects under similar category and fetch them when required. Now, you can group all the project related to finance, budget, accounts, price under Accounts. Project Groups will help you do this in a jiffy. 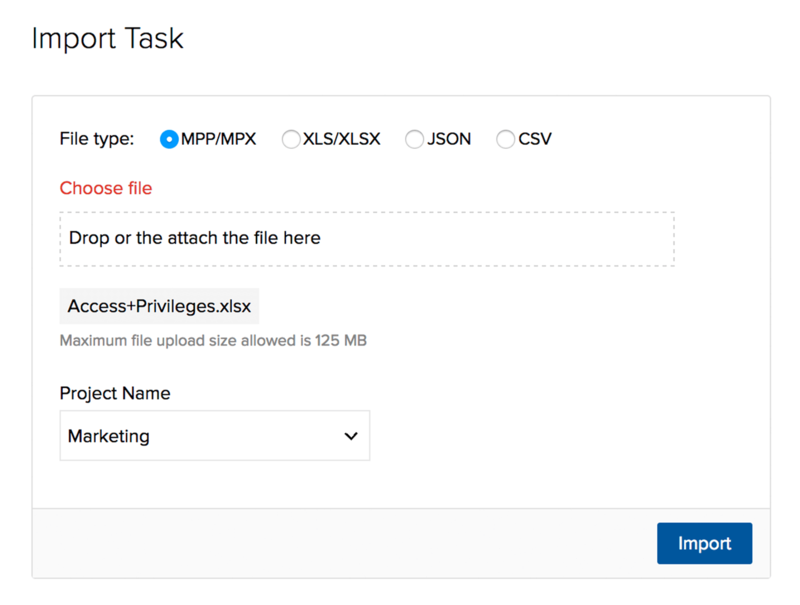 Click to learn more about access privileges for managing groups. Create a new project group based on your business requirements. Navigate to Projects, click in the upper-right corner and then select Manage Groups. Projects are displayed based on RECENT PROJECTS, ACTIVE PROJECTS (Projects and their groups), and All Projects (Projects that are not associated with any groups). Click + Click or Drop project(s) to create a group. Enter the group name for the projects that you want to group together in the Group Name. Click Create Group to create a project group. You can also drag and drop projects from Active Projects to + Click or Drop project(s) to create a group, and then create a group if required. You can create multiple project groups or associate multiple groups to a single project group. After creating a project group, you can effectively organize and manage the groups according to your preferences. All the actions are right within the groups to get your work done on time. Hover over the required project group and click to edit the project group. Hover over the required project group and click to remove the project group. Click to drag and drop the project groups based on your choice, and then click Save Order to save the project group order. Click a project group and view the list of projects associated with the project group. Search for projects using Project Search in the upper-right corner of the Active Projects. (i.e.) However, it is case-sensitive. However, any projects associated with the project group will not be deleted instead, they will be moved into Active Projects. A warning message is displayed, when you delete a project group. Click Ok and delete. Create a new project and associate it with a project group. Click New Project in the upper-right corner in Projects. Select the Project Owner in Owner. Select a project template in Choose a Template. If you create a project from an existing project template, the Project Start Date option is enabled. Select a start date for the project in Project Start Date. Enter a brief summary on your project in Project Overview. Select the Show this project overview by default checkbox, if you wish to display the project overview summary in the project Dashboard. Select the budget option to estimate project in Project Budget. Projects can be estimated Based on Amount or Based on Hours. Select a project group in Group Name to associate the project. If required, hover over the Group Name, and then click Add New Group to create a new project group. Indicate the privileges to access the project in Project Access. Learn More about public and private projects. Click Add Project to create a new project. If required, you can also edit the project and modify its Group Name. Learn More about editing projects. If available, custom fields are populated while creating or editing the projects. Learn More about custom fields. Reorder projects within a project group as desired. Click the desired project group and then click the icon to reorder the projects. You can also alphabetically sort the projects by clicking the reorder icon and selecting the Alphabetically Sort link. Now, select Save Order to save the list. Import MPP/XLS/JSON/CSV files into Zoho Projects and start collaborating. Select Import in the Data Administration. Select MPP and Other File Format. Click the Import Task Task tab, and then click Choose File to select the desired file to import. Indicate the file type in File type. Select the desired project in Project Name. Associate the imported file with their corresponding task fields. Select the date format of the imported file inSelect date format. A warning message about applying default values to mismatched fields is displayed. Click OK to continue the import. A flash message about the scheduled import is displayed. All the task list available in the imported file are listed in the Classic View. If you map the TASK OWNER to its corresponding XSL field and continue to import, the Import XLS File wizard is displayed. In this wizard, you can choose to leave the tasks unassigned or associate the XLS users to project users. While importing, if you map only theTASKLIST ID, the corresponding task list alone is imported, even if there are identical tasklist names. However, if you map the TASKLIST NAME, all the available task list with the given task list name are imported irrespective of their task list ID. Ungroup projects associated with a project group, if required. Click the desired project group to view its associated projects. Click on the desired project and then drag and drop the projects into Active Projects. A warning message about removing the projects from that project group is displayed. Click OK to remove the projects from its project group. To remove a single project, you can hover over the project and select right next to the project to remove only that project from its project group. Click the View by Client tab and then click the Manage Groups icon in the left corner, to view the client projects and associate projects to the desired client group. To associate a project to a client group, you need to drag and drop the project into the desired client group. In View by Client, you can view the client projects associated with client groups and other projects associated with the organization. Click the drop down in the Projects and select View by Client to view the client projects. However, to add a client group, you can add clients only from All Users. You can add a new project, import .mpp files, edit and delete projects in View by Client view.